It is with heartfelt sadness, that we announce the sudden passing of our beloved son, Malcolm on Wednesday, March 28, 2012, in a tragic car accident in Millville. Born in Glace Bay on March 22, 1990, he was the eldest son of Brian and Angela (Cole) Parsons of Maple Avenue, Glace Bay. Malcolm was a member of Newsom United Church, Glace Bay. 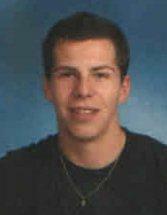 He graduated from Glace Bay High School in 2010 and was employed by Stream International. Malcolm will be remembered for his big heart and beautiful smile. He was always there to help a friend in need. Malcolm enjoyed hockey and he played in the Glace Bay minor league as a youth. He enjoyed Ski-Dooing with his friend, Benny and the boys. He also enjoyed building cabins with his brothers and doing mechanical work on Ski-Doos and motor bikes. He will truly be missed by all who knew him. Besides his parents, Malcolm is survived by his brothers, Jeffery, Mathew, Jordan, all at home; maternal grandparents, Harold (Agnes) Cole; paternal grandparents, Calvin (Bernice) Parsons; maternal great-grandmother, Mary MacIntosh; aunts, uncles and cousins. Malcolm will also be sadly missed by his special friends, Rachael MacRae and Tia Walsh. He was predeceased by his brother, Jonathan, maternal great-grandfather, Malcolm Stewart MacIntosh, paternal great-grandparents, Billy and Mary Boutilier and Hubert and Sarah Parsons. Visitation will be held Sunday from 2-4 and 7-9 p.m. in the V.J. McGillivray Funeral Home, 16 Reserve St., Glace Bay. The funeral service, officiated by Rev. Michael Goodfellow and assisted by Rev. Vernon Reid is Monday morning at 11 a.m. in Newsom United Church, followed by interment in Forest Haven Memorial Gardens. A reception will be held at Newsom United Hall. As an expression of sympathy for Malcolm, memorial donations in his memory may be made to a charity of one’s choice. Online condolences can also be expressed through the funeral home website www.vjmcgillivray.ca.